** The very basics of programming to write a small program to flash the LEDs. * The class attendees will be using a computer so basic knowledge of Windows and typing skills would be required. Kids are welcome but they should be at least 10 years old. * Attendees are not required to bring anything and will leave with a hand out of material of the class. Sign up to the announcement list to keep up with our group. Follow us on Twitter @Bloominglabs and Facebook. Our IRC server is at irc.bloominglabs.org:6667, #hackerspace. 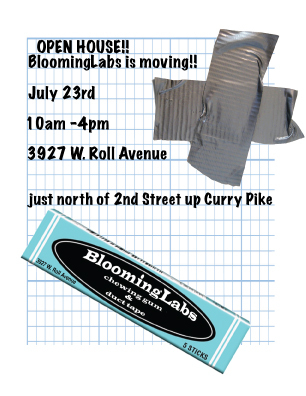 We can also be reached via old fashioned email at contact (]at[) bloominglabs dot o r g.
2 We have found a new space! 5 What is a hacker space? 9 What needs to be done yet? We have found a new space! We are now the proud leasers of a new space! It's 1,000 sq ft of which 750 sq ft is unfinished, cement floor workspace and 250 sq ft is finished office space for hanging out. There's also a full bathroom. The address is 3927 W. Roll Avenue which is just north of 2nd Street up Curry Pike. We take over the space on July 1st. Rent is about 20% higher than our current space, but it's over 5 times more room! And it's ours to use 24/7 without any worries about bothering other tenants. Keep an eye out for party plans sometime in July! We will be having an Open House on July 23rd from 10am until 4pm. Please come out and see the space. Bring your friends as well! Currently we meet every Wednesday at 7:00pm at 3927 W. Roll Avenue, Bloomington, Indiana. These meetings are open to the public, anyone is welcome to attend. We usually meet for 2-3 hours and have a lot of fun. Having access to tools is only part of the equation, socializing with people and learning from each other is another large benefit from our group. Pretty much whatever people want to work on or learn is fair game. We currently have an electronics and robotics focus but there's also interest in general science and astronomy as well. If it's cool and interesting then we are all interested.